The pop singer and rapper first came under fire in 2013 when songwriters Devin 'De Rico' Copeland and Mareio Overton filed a lawsuit against them. The case was dismissed after a federal judge ruled the two tracks were "significantly" different but the US Circuit Court of Appeals in Richmond, Virginia has now overridden the earlier decision. Circuit judge Pamela Harris wrote: "After listening to the Copeland song and the Bieber and Usher songs as wholes, we conclude that their choruses are similar enough and also significant enough that a reasonably jury could find the songs intrinsically similar." Harris added that even the main lyric "somebody to love" was performed in an "almost identical rhythm and a strikingly similar melody". Vivendi SA's Universal Music Publishing Group and Sony Corp's Sony/ATV Music Publishing are among the other defendants. Lawyer for the claimants Duncan Byers are pleased that the court has "recognised it's the same melody and the same chorus", Sky News reports. Bieber and Usher's version of "Somebody To Love" reached number 15 on the Billboard Hot 100 in 2010 while Copeland and Overton wrote theirs in 2008. 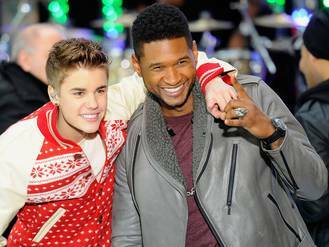 The claimants allege that music scouts played their song for Usher who passed it on to Bieber. The case follows Pharrell Williams and Robin Thicke's copyright trial over global chart-topper "Blurred Lines" earlier this year. Both artists were ordered to pay millions to Marvin Gaye's family after a jury found them to have infringed copyright on the soul singer's 1977 song "Got To Give It Up".